Here at Simpson we love technology. We enjoy the convenience it brings to our lives and we welcome the boost it gives to our performance. The strength, stiffness and efficiency of modern bikes are truly astonishing compared to what came before them and we wouldn’t have it any other way. We eagerly adopt the latest developments in everything from shoe technology to frame materials and we bask in the glow created by the improvements they enable in our performance. But we also believe that every now and then it’s a really good idea to set aside some of the technology at our disposal. Park the Garmin, forget about Strava, dust off the hack bike and leave the Lycra in the wardrobe. Freed from the niggling urge to improve on your segment times or nail a KOM you will have more time to take in the views around you. Unaware of your average speed you will relax into a comfortable pace that allows you to chat to the people you pass – or who pass you. This is why we’re so excited about L’Eroica Britannia, the vintage ride we’ll be joining at the end of next week in Derbyshire. 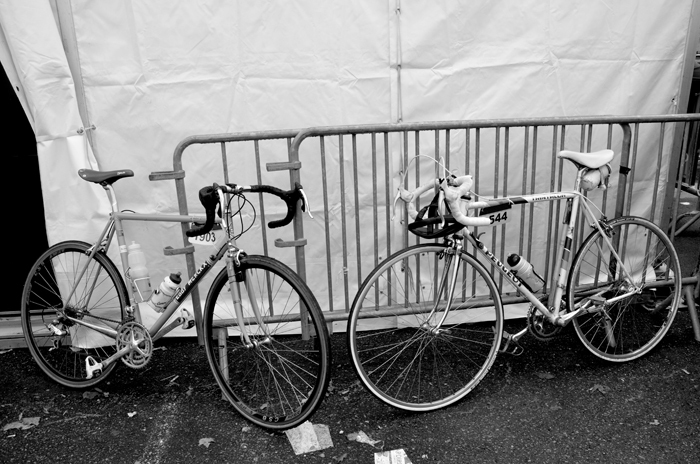 We will sit astride our heavy, unsophisticated steel bikes that were built before we were born. We’ll rejoice in our woollen shorts and cleatless shoes and we will labour up those hills and try not to go too fast downhill because our old brakes won’t work very well. We will feel like heroes for completing the 55 mile ride and all the while we will be smiling like fools – celebrating that simplest of pleasures: riding our bikes.